Although this article focuses on the laboratory, we believe it is important to not isolate the laboratory as a unit. In our experience, implementation of Lean Laboratory occurs best when it is properly integrated with Manufacturing and QA responsibilities. Since these responsibilities dovetail closely, the laboratory can often cause issues which affect the ability of the laboratory unit to fulfill its analysis charter. The first part of any Lean Laboratory process is the pre-assessment phase which should involve the appointment of a team lead and cross functional team that includes a quality assurance individual. The team leader for each site should be appointed by senior management and have all the functional experience required to manage the process. SMART Pharmaceutical Consulting consultants play a key role in performing and managing the process at our client sites. For this to be a success, it is important that the consultants and team leader have the confidence of the project team members and the authority to carry out the role. With this system in place, the first order of business is to create a team charter which sets out the purpose of the program and its goals. An example of a team charter is given below. This should be agreed with and signed by senior management and the team leader. It is important that this is completed early on in the process so there is no ambiguity about what is required and/or intended. Following the creation of the charter, it is vital that any new policies for the program are put in place quickly to facilitate the process as well as the creation of the necessary budgets. Reporting structures can be then be decided upon and a timeline can be developed for the project development and completion. To create the appropriate momentum to ensure the success of the program, it is incumbent upon management to create a customer-centric vision for the team which stresses the importance of human resources involved and a “right-first-time” operating philosophy. This part of the process usually takes 1-2 weeks. The next phase involves the Diagnostic Assessment phase. Typically, this can last from 2 to 4 weeks in duration, but should be long enough to be able to gather sufficient information to provide a basis for an informed analysis to be completed. Here the Lean project team members, led by consultants, gather important and necessary data about the existing process so as to enable a thorough analysis to be performed. Although consultants will do the bulk of these assessments, it is important to involve the site team so that they learn the techniques and methodologies side-by-side to enable the development of a continuous improvement culture. Post consulting company project involvement, this should be a continuous and on-going process for the site team as part of their new operating philosophy. Process data associated with labor levels, cycle times, units per shift analysis, errors/deviations per shift, and analysis completed on time, are all examples of typical information that will need to be collected during this phase. All types of performance measures are those which need to be gathered and tabulated for analysis and evaluation. One useful tool for completing this process is a Supplier-Input Process-Output Customer tool (SIPOC). This will involve Gemba walks, operational metrics collection, use of videotaping aspects of the laboratory process and modeling of the process after it has been observed and documented. The best practice strategies are developed by being patient and resisting the urge to force the exercise because of the desire to be proactive in making changes. The most important thing to keep front and center in carrying out this process is to realize that the depth and quality of this analysis will drive the quality of the subsequent improvement phase and set the stage for the switch in operational mindset and associated execution. Key processes in this stage include: laboratory layout/design, tools to use (such as process flow charts, value stream maps, spaghetti diagram), culture management and metrics. As previously mentioned, early integration with manufacturing and QA responsibilities will pay huge dividends when upgrading the performance of QC analytical laboratories. In particular, a Lean enterprising approached a data handling and data management as well as regulatory considerations will be extremely important in order to maintain data integrity and not fall file of regulatory compliance requirements. From our experience, we see that there is a great deal of wasted time between individual operations, uneven flow of samples in and out of the laboratory and individualized site processes for dealing with errors and out of specification results. These are only a few examples. All of these contribute to significant inefficiencies and compliance problems. Frequently, this is compounded by ineffective equipment layouts/footprints which hinder the operational staff’s capabilities to perform their professional duties. The illustration below demonstrates how uneven flow causes instability in the laboratory operation. In conjunction with the GMP compliance aspects of the program, it is not a bad idea to complete a review of the quality batch release program which involves QC at critical stages. By conducting a thorough review of the analytical testing, cycle time and results review process together with the whole QA approval cycle, it is possible to provide significant benefit which will address the ultimate goal of getting product out to the commercial markets quicker and in a reliable state of compliance. From a total quality prospective, the Current State may be illustrated using a “problem funnel” which represents the diverse number of issues that the QC/QA team will handle as part of their day-to-day operations/responsibilities. These can include but are not limited to: change control, laboratory errors/deviations, batch record release results and complaints. All of these are collected in the body of the funnel and are passed down into the spout region where they exit the funnel. Each issue is caught and handled as they arrive, associated with a particular sample and/or production batch. This method often results in an uncontrolled mechanism to resolve the issues, provides no opportunity for the group to take a step back and implement improvements that would slow down, and ultimately diminish the flow of issues gathering in the funnel. The individual site dependent mechanisms lead to an inconsistent handling of the issues. Often it does not provide adequate resolution of the problems and, when integrated with other departments with which they are interacting (namely QA and production), these can turn into fire drill type emergencies. A better way of dealing with these issues is to develop a unified communication mechanism that provides for a “Consensus Forward Strategy” which looks out 60 to 90 days in order to avert these types of problems from reoccurring. Through a formalized gap analysis and value stream evaluation, it should be possible to identify and improve many of the mechanisms that contribute to a problem and develop appropriate resolutions. 1. Slow down the pace of problems emanating from the funnel; a possible solution would be to use a tier level meeting strategy which involves cross functional departments and longer term site to site forums. 2. Create a mechanism for the implementation of continuous improvement strategies. This would involve the implementation of Lean leveling tools to modulate the flow of work so as to reduce extreme highs and lows associate with sample analysis. Such a tool might involve the implementation of a rhythm wheel/carousel for release and complaints resolution. The Current State does not allow time to develop and deploy solutions that would improve the control of flow of issues. In the Future State, these very same problems will be dealt with much earlier or would not occur at all due to the fact that proactive changes in working practices would diminish or eliminate their impact on day-to-day operation. This difference between the Current State and the Future State is a period of opportunity which we might call the “Proactive Index.” The Proactive Index represents the time between an incident and when it becomes an emergency. It is this time difference that needs to be addressed in order to create new opportunity time for continuous improvement programs to become routine. In order to get the maximum benefit from the QC analytical laboratory, it is desirable for the flow of samples to be analyzed to be in sync with the needs of the production department and QA. As a result, coordination on a daily basis with those departments is desirable in order to achieve maximum efficiency, productivity, cost effectiveness and sustainable regulatory compliance. Through the use of a series of tier mechanisms, a methodology is provided to address a variety of level of issues with increasing seniority of attention, but only when immediate staff level intervention does not lead to a satisfactory resolution. Three tier levels of meeting produce the desired effect within excess of 90% typically resolved at the basic Tier 1 stage. Tier 1 level meetings should be a daily 15 to 30 minute meeting to begin each day. These meetings are mandatory for managers with line responsibilities. The meetings should be used to provide an overview of key communication issues and current state issues, problems and resolutions. These discussions provide a general opportunity for all team members to understand the issues and contribute to a consensus solution. This is most effective when all members of the team have access to common information so that there is maximum possibility for best practice development and deployment. Tier 1 meetings should be very high visibility so that all team members can see the information flow and have access to the resolutions for common problems. From site-to-site perspective, these types of information gatherings can be placed on the company’s shared file system so that, common approaches to similar issues can be applied and standardized into company policy and practices. Tier 2 meetings are manager-director meetings that occur once a week for 30 to 45 minutes to discuss strategic to tactical deployment resolutions. All the material captured shall be shared in a shared file system with an access code which can be made available through a site-wide sharing file system. The Tier 2 management team should set up a rolling Tier 2 level action team to respond to the escalation of Tier 1 issues that were not resolved resolvable at Tier 1 meetings. Tier 3 meetings should be once a month opportunity for the department head to discuss performance and performance related improvements with his/her direct reports. These discussions can also include interdepartmental peers from QA and production, as desired. Tier 3 meetings can also be used as the uppermost band in the escalation process, where an emergency situation that may not have been resolved at Tier 1 and Tier 2 meetings can be addressed and resolved. These consultations should occur on an as-needed basis. This is an area which typically consumes a significant proportion of the quality the Quality department’s resources. If it is properly integrated with the job functions from production and QC, it is possible for major savings to be made and fewer compliance related issues to arise. The mechanism (which provides significant opportunity), is where the Future State would involve the use of a carousel/rhythm wheel. Carousel/rhythm wheels allow for records from products to be regularly reviewed during an acceptable, predetermined time interval with the use of a T card mechanism associated with the carousel/rhythm wheel for the resolution of deviations. In operating this system, management would provide “oversight review” as system SME specialists and would only involve themselves with the resolution of serious deviations that junior QA specialists may not have the bandwidth to handle. Using this approach, it is possible to significantly speed up the approval process and provide for a better use of labor resources that is appropriate to the degree of complexity of the material being reviewed. In situations where deviations require an extra special level of attention and/or experience, use of an electronic T card mechanism allows for these deviations to be flagged using red T cards for high visibility so that they receive immediate and appropriate attention. A pictorial of this type of mechanism is provided in the illustration below. Much of this would be developed from data sets and observations made during the diagnostic phase. As a result, during this diagnostic phase the team should receive some training in process value analysis as well as additional tools in lean from the Lean Toolbox. An important aspect is to move where opportunities exist for waste elimination. The next stage involves the analysis of the Current State and its mapping. Both process flow and value stream mapping are extremely useful during this phase with the Value Stream Mapping providing the more detailed representation once the project team is comfortable with the overall understanding of the process flow. Although there are many other tools that will prove useful, moving forward without proper attention to these details will make it impossible to obtain a clear picture of the Current State. One should plan for the Current State assessment to take several weeks so that the current metrics can be analyzed, key performance indicators reviewed challenged and assessed. Most important is that the value and the relevance of these in the new desired Future State properly align with the business goals of the organization moving forward. With the Current State fully mapped, analyzed and understood, the process shifts to the definition of the new Desired/Future State. In developing this new state, it is important to incorporate as many simple value added features as possible without creating a new encumbering network that leads to small gains. Although small gains are good and significant when assessed cumulatively, completing a Lean program provides opportunities to challenge the status quo and to make significant systemic alterations in the way the business is operated. The goal should be to seize that opportunity and to squeeze every ounce of horsepower out of the new strategy to make sure this change will stick and be sustainable. The Future State is created from utilizing the company vision and policies with a solution strategy that will reduce waste and improve efficiency and cost effectiveness of the laboratory being operated. In programming these ideas, it is useful to develop a gap analysis of the shortfalls that the Current State design has in relation to meeting the desired goals. It is then possible to clearly define the areas that will require attention. This process should be given sufficient time to allow the value issues to be fully analyzed and number of solutions created. Once the Future State design is set and agreed upon, the transition plan can be prepared. This plan should detail every element requiring attention as part of the scope. A timeline estimate for each element, together with the necessary resources, should be included. In completing this exercise, a work-breakdown structure should be created as part of the transition plan. This will form the basis of the implementation during the deployment phase. The “As Is” and “To Be” value stream map should be developed for both the Current State and Future State processes by the integrated cross functional team. This is most powerful tool to use at this point because it crystallizes and clarifies the understanding of all the elements involved in the process. Using these maps together with an integrated review of the Key performance Indicators (KPI’s), it is possible to gain a detailed understanding of the Current State process and what the Future state will like. The KPI’s chosen for the laboratory, reflect the priorities for the particular company but are frequently associated with performance improvement issues and initiatives. By definition, they should be measurable clear to interpret and have value. Note: KPI’s are measurements selected for a process that provide a mechanism to numerically quantify the level of performance at any given period. The table below has some useful KPI’s for a laboratory process. KPI’s are often chosen to be “S.M.A.R.T.” criteria. The measurement has: a Specific purpose for the business, is Measurable, is Achievable, is Relevant to the business success and has a Time-phased element that reports S.M.A.R.T. provides a basis to highlight the areas of constraints in the process and non-value added features that are holding back realizing the full potential of the laboratory. All the highlighted areas of constraints capacity are opportunities for meaningful improvement in the process so these need to be the areas of immediate focus. Having a clear understanding of why something is a constraint, whether it is a system failure event or just an unrefined process action, is extremely useful because it provides the basis for improvement opportunity. Several possibilities exist to provide useful information about the process. Two of these include: Failure Mode Effects Analysis (FMEA) and Ishikawa analysis (aka Fishbone Analysis). Both of these techniques provide information about the internal workings and causes of something not functioning as desired. FMEA is a particularly useful process since it enables potential causes of failures to be analyzed and ranked in terms of their severity and probability. The impact of these actions can be determined and suitable corrective actions can be made to assure that they do not hinder production efficiency and operational capability. Using FMEA, potential issues may be considered and ranked for probable likelihood to disrupt smooth flow and Lean operations at every level. The output from this type of analysis is the development of actions that reduce the likelihood of failure. This analysis is part of the risk management arsenal that is used to mitigate areas of vulnerability and weakness. Below illustrates dealing with “Cycle of Events in FMEA”. In terms of ranking, the priority numbering is critical to determine since it will decide what issue will require highest priority in terms of resources and attention. Using the Ishikawa analysis methodology, it is possible to define the reasons for constraints and in doing so this highlights the possibilities for process improvements. Using the Five Whys approach and the Fishbone structure, it is possible to develop a clear understanding of the reasons behind a particular constraint. The figure below highlights various options using this technique. Using this analysis, one can develop one’s approach and refine what the Future State should look like as one involves one’s vision of the Future State. 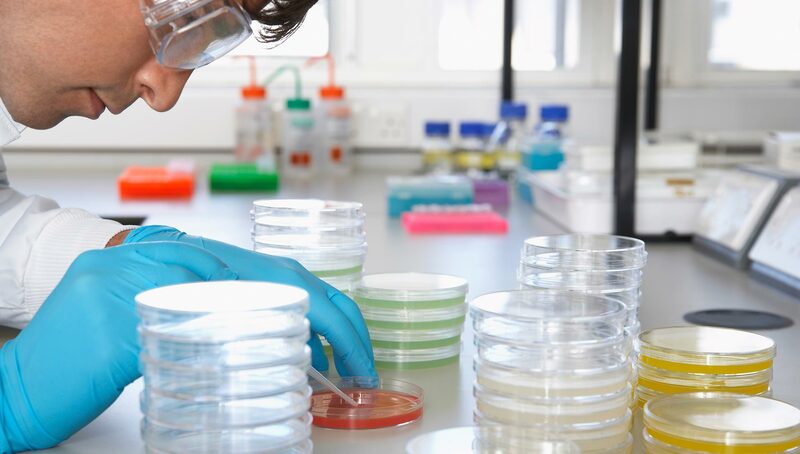 With these fundamental techniques in place (which drive data points and reasons for improvement), one can wrap around a variety of other Lean tools which will have a marked effect on efficient operation in a sustainable compliance laboratory operation. These other Lean tools will include 5S, which is a universal tool that can be used to create order and standardization within the laboratory environment, standardized work plans and standard work with defined work breakdown structures for the completion of all tasks. This will be important during the rollout of the transition plan from the Current State to the Future State. Establishment of leveling tools such as carousel/rhythm wheel mechanisms to smooth flow and make sample analysis predictable. Use of kaizen continuous improvement methodology to establish poke yoke procedures, visual management tools and reporting display boards for enhance communication. All this will be accomplished through the establishment of leadership SMEs that are appropriately coached and trained in how to use lean tools to generate sustainable improvement metrics. Through the subsequent generation and interpretation of these metrics it will be possible to generate enhance translatable practices in a harmonized way to all company sites requiring improvement.